Think outside the box. No, really. Well, at least think outside the bathroom cabinet box. 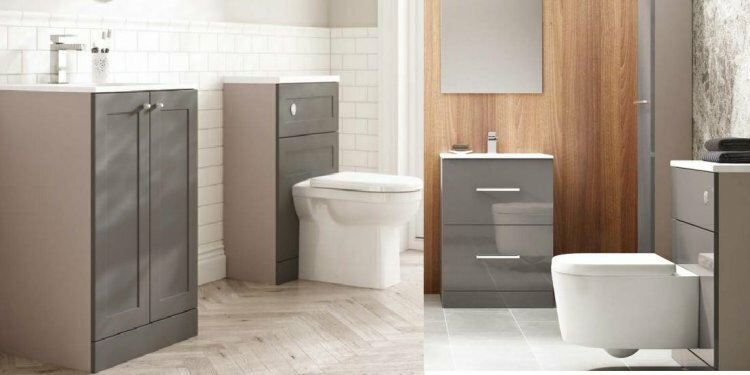 The trend now is to create bathroom storage space using standout pieces of furniture that offer anything but a square look. "Nobody wants it to look standard anymore, " says Fresno-based designer Rumy Thompson. "People want cabinetry that looks like an elegant piece of furniture. Cabinet shops build what looks like furniture and you've also got these cool import companies, like Horchow, that sell interesting storage pieces." San Diego-based designer Leslie Cohen says she loves taking antique pieces of furniture and putting marble tops on them, but she admits that any beloved piece of furniture will do. "You can take almost any piece of furniture and turn it into some sort of cabinetry, " she says. For instance, if you find a piece you like from a manufacturer and it won't fit in your bathroom, ask for a different size. "A lot of times you can order a different depth or height. I saw a piece of furniture at Genghis Khan ( that I loved for a client. I asked them to make me a shallower cabinet like it out of rosewood and they did, " she says. You can also have the furniture cut down if the drawers are too deep, says Cohen. Many designers also create the furniture look by setting cabinets on top of the vanity countertop. "I hang sconces on the cabinets and it looks like a big piece of furniture and you get some nice side lighting on your face, " says Cohen. Fresno-based designer Joyce Gaskins says she puts pillar-shaped glass or wood cabinets on top of the vanity and includes a four-plex plug inside each of them. "It's very convenient. You don't have to unplug your appliances. You can just take them out and stick them back in, " she says. While vanities used to be the focal point of bathrooms, accent pieces that serve as cabinets are now just as eye-catching. "Bathrooms aren't just for vanities anymore, " says Anthony Passanante, a designer in Wyckoff, N.J. "It's a place where people can display things too, so accent pieces are very popular. They're freestanding but can be in the same material as the vanity. "When you first walk into the bathroom, you see this freestanding piece that adds color. And you can bring in more texture by rolling up towels, displaying some pictures or nice perfume bottles, " says Passanante. Having rolled-up towels and special soaps exposed in a glass cased cabinet is an easy way to create a spa-like look at home. If an additional piece of furniture or cabinetry won't fit in your bathroom, consider using the extra space between the studs of the walls. "If you really want to think outside the box, instead of cabinets all the time, you can turn recessed niches into wall shelves or cabinets, " says Cohen. "I've made framed textured glass doors that are flush onto the wall. It looks like glass floating on the wall, but you've got all your deodorants and things hiding in there. That's looking beyond the cabinet box completely." This is a fun site to navigate, although you'll have to be creative as there aren't many pieces of furniture that are specific to the bathroom. If you're looking for something that stands out and that you can't find at one of your local big box stores, start exploring The Horchow Collection. Roger Horchow started his mail-order business in 1971 to offer customers unique decorative pieces from around the world. Here, you'll be inspired by cool geometric shapes, fabulous hand-painted pieces and curio cabinets that can hold linen, too. Browse this website and you'll see that box-shaped cabinets do still have a place in the bathroom, even if the trend is toward using furniture to store and display things. If you're looking for a tall rectangular cabinet or a cabinet to hang on the wall, this is a site worth navigating. The choices are ample and the prices are reasonable.